Established in 1859 Hendy Group are a major car sales group covering the South Coast of England. Hendy Group made contact with HMF to look at the viability of fitting a large mezzanine floor within a building in Fareham to see if their parts operation could be relocated to the site. HMF had carried out a similar project for Hendy Group some 20 years ago which again involved a large mezzanine floor & the complete fit out of their parts operation for the group. 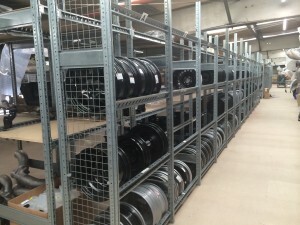 The existing parts operation was based in Hedge End & this has an extension parts operation stretching over 2 floor levels with automotive adjustable shelving & pallet racking storing a vast range of car parts. HMF evaluated the new building in Fareham & came up with a mezzanine design that was ultra-thin as there was limited headroom within the new building. The new mezzanine design included suspended drop down landings to meet the floor levels of an existing 2 storey part of the building. These walkway links provided protected means of escape to satisfy Building Control at that end of the building & also afforded operational access to the existing first floor offices. An additional 3 steel staircases were provided to give ease of picking efficiency including a DDA compliant General Access staircase with a mid-landing. 2 additional Utility Escape staircases were also provided as well as 2 transfer link staircases. Due to the size of the mezzanine floor in relation to the building HMF had to fire rate the mezzanine to 1 hour using 1 hour suspended ceilings, 1 hour column casings & 1 hour fascia. LED batten lighting was provided by HMF above & below the mezzanine to ensure the new facility’s energy efficiency was maximised. 3 hour non-maintained emergency lighting was also provided throughout the installation. HMF designed the new parts facility around a large quantity of new shelving but also to save cost allowed for the relocation of the existing shelving from the Hedge End site. Additional pallet racking with decking was also provided to allow the safe storage of larger bulk parts & pallets with fork lift truck access. Anti-collapse mesh was also provided to alleviate the risk of parts spilling from the back of the racking onto operatives working behind the racking. 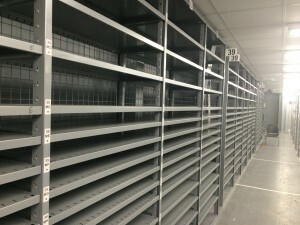 Once the shell spec was completed HMF provided a large team of 15 persons to resite the existing shelving working closely with the Hendy Group parts team who were at the same time relocating the parts. The main parts move commenced on a Friday & was completed over a long weekend by the following Monday so that Hendy Group could operate as normal on the Monday. 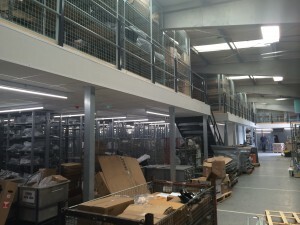 This £330K mezzanine fit out project was completed on time & within budget.